Explanation: Is there an ocean below Sputnik Planum on Pluto? The unusually smooth 1000-km wide golden expanse, visible in the featured image from New Horizons, appears segmented into convection cells. But how was this region created? One hypothesis now holds the answer to be a great impact that stirred up an underground ocean of salt water roughly 100-kilometres thick. The featured image of Sputnik Planum, part of the larger heart-shaped Tombaugh Regio, was taken last July and shows true details in exaggerated colours. 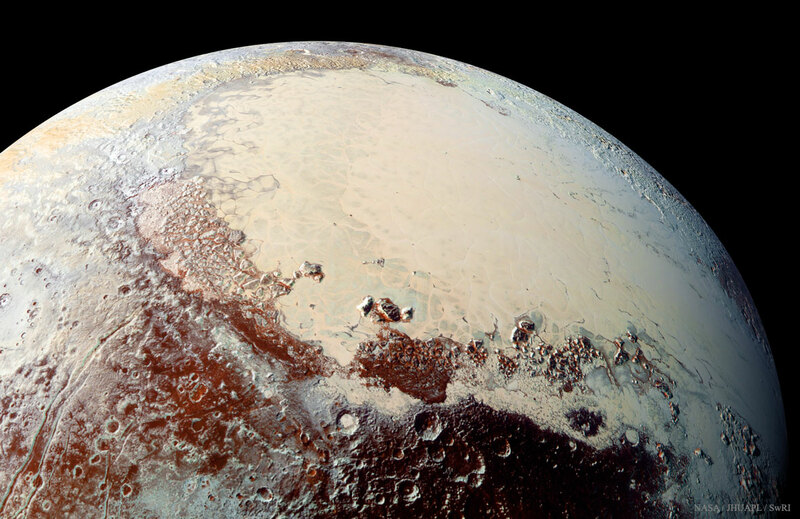 Although the robotic New Horizons spacecraft is off on a new adventure, continued computer-modeling of this surprising surface feature on Pluto is likely to lead to more refined speculations about what lies beneath.